Sleep easy, America. Your children are safe. In a rare victory in the war on drugs, the one-man drug menage called Willie Nelson was arrested Friday at a border stop in southwest Texas. SIERRA BLANCA, Texas (AP) — A U.S. Border Patrol spokesman says country singer Willie Nelson was charged with marijuana possession after 6 ounces was found aboard his tour bus in Texas. Patrol spokesman Bill Brooks says the bus pulled into the Sierra Blanca, Texas, checkpoint about 9 a.m. Friday. Brooks says an officer smelled pot when a door was opened and a search turned up marijuana. Brooks says the Hudspeth County sheriff was contacted and Nelson was among three people arrested. Uh, sheriff — no it is not surprising. 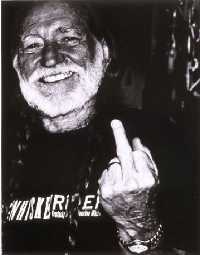 It is Willie Nelson. Perhaps one of the best known pot smokers on the planet. And why oh why is the Border Patrol making 70 to 100 “drug-related arrests” a week at a single US interstate barricade? That is not its job. Nelson is 77 years old. wow, you would think at his age he would know better... thanks for posting. The world is safe now. I feel so much better. Good to know America is now a safer place.